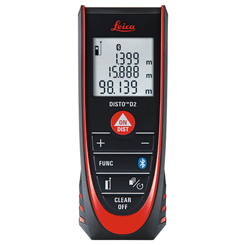 Whilst LEICA have been building precision surveying equipment since 1921, this knowledge and expertise has channelled it’s way into the invention of the first hand-held laser. Today, the last 20 years of Swiss innovation can be experienced in the palm of your hand with a range of innovative products offering technical and accurate solutions for measuring with the latest technology. There are Disto™, Lino™, Rugby™ and Jogger™ , just a few examples of some of their best-selling models. Professionals will enjoy the speed and ease from the Hand-Held Laser Levels, modern features including Bluetooth technology with the highest accuracy over long distances in their Grade Lasers. Choose Leica for when it has to be right. Have a question about our Leica range? We‘ll be happy to answer any enquiries. Send us a message here.